BIOGRAPHICAL BACKGROUND: Charlie worked for the railroad all across the Pacific Northwest for years, and it was during that time he discovered Astoria. For the next Chapter of Charlie’s life he opened an antique store in Portland. Eventually that store closed store so he could go on the road traveling across the West buying and selling antiques. Charlie hit up to 30 shows a year! 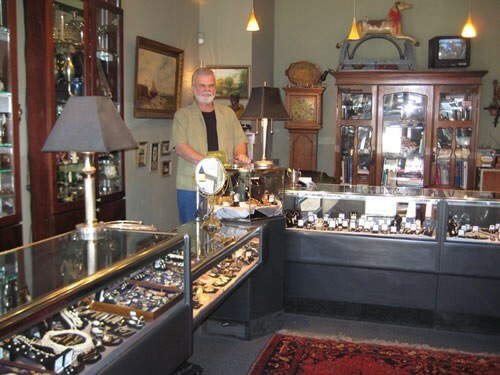 ORGIN STORY… AND WHY ASTORIA: After many years buying and selling antiques Charlie decided to settle down in one of two favorite Oregon Towns he discovered when working for the railroad: Ashland or Astoria. In 2001, Charlie moved to and opened the Jonathon’s in Astoria. WHAT MAKES YOU STAND OUT; SPECIAL PRODUCTS/SERVICES?? Charlie’s knowledge of antique glass, old books, prints, furniture, and jewelry. Charlies sources for his stores at antiques and jewelry trade shows, picking, and antique jewelry brokers. Jonathon’s is a value seekers Paradise. Exceptional jewelry, from vintage 1840s to modern designs. DOWNTOWN DREAM /VISION FOR ASTORIA: To see Astoria continue the growth pattern we’re currently on.